Educational, unique, organized, and a whole lot of fun! For those who want to see Florida wildlife up close and personal, Jungle Adventures Nature Park is the perfect place! Their motto "It's all so close to civilization...yet still a world apart" says it all. Jungle Adventures Nature Park is located in Christmas, Florida just northeast of Orlando, southwest of Daytona, and west of the Space Coast. It is a short drive from any of those vacation hotspots and well worth the drive. Visitors enter Jungle Adventures Nature Animal Park through the famous 200 foot long roadside wonder, Swampy, the World's Largest Alligator - an alligator-shaped building that also houses a cafe and gift shop. In the park, you'll be offered live guided wildlife encounters with rare Florida panthers, black bears, grey wolves, white-tailed deer, tropical birds, and other reptiles and mammals. 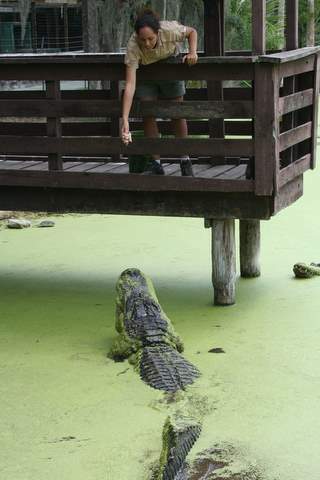 If you are adventurous, as we were, you can take a Jungle Swamp Cruise and be surrounded by more than 200 Alligators! The gator feeding is a spectacular sight as incredibly large gators jump out of the swamp to snap food from the feeders. The Replica Spanish Fort shows how Spanish Conquistadores lived in the 16th Century and the Native American Indian Village Replica where a native american author gives scheduled talks on Florida history. Our tour included an incredible hands-on experience where we actually held a gator, a scorpion, a tarantula, and a python! For a small fee, children can rent a feeding pole and feed baby gators themselves! We highly recommend Jungle Adventures Nature Animal Park. It is educational, unique, organized, and a whole lot of fun! Watch our video of Jungle Adventures below.